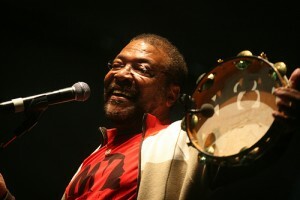 Martinho da Vila (born Martinho José Ferreira on February 12, 1938 in Duas Barras, Rio de Janeiro) is a Brazilian samba musician (singer and composer). He is most associated with the samba school Vila Isabel, and his own compositions (sambas de enredo) have been annually inaugurated by Vila Isabel in Rio de Janeiro’s Carnaval competition for decades. His signature song, “Casa de Bamba,” which dates back to the 1970s, is one of Brazilians’ most beloved sambas. At age 75, he is still doing concerts and his lyrics continue to rally the spirits of audiences throughout Brazil. His 1995 CD “Ta Delicia Ta Gostoso” sold more than a million copies. His music shows influence from the region where he was born, such as the calango rhythm. He is also politically active and a prominent figure and spokesperson for Afro-Brazilian issues as well as for the Brazilian Communist Party. He is the author of six books, and has been a recording artist since 1969. An important composer of the samba of the hills, Martinho da Vila has written many successful sambas-enredo (the vehicles for the parades of the samba schools during the Carioca Carnival). As a composer and interpreter, he has recorded more than 30 LPs and CDs, some of which have sold over one million copies. His songs have been recorded by many interpreters, among them Simone, Beth Carvalho, Roberto Ribeiro, and Alcione. At 13, da Vila began to frequent the Escola de Samba Aprendizes da Boca do Mato. At 15, he wrote the samba de terreiro “Piquenique.” In 1957, he began to write one samba-enredo per year for his samba school’s parade, beginning with “Carlos Gomes” in that year, and following with “Tamandaré” (1958), “Machado de Assis” (1959), “Rui Barbosa na Conferência de Haia” (1960), and nine others in subsequent years. Along with the role of composer, he also was the mestre de harmonia of that school. In 1965, the school paraded to his samba “Construtores da Cidade do Rio de Janeiro,” and in the next year he moved to G.R.E.S. Unidos de Vila Isabel (where he developed a new style of samba-enredo) and adopted the nickname Martinho da Vila. In 1967, he participated in the III FMPB with the partido-alto “Menina moça.” In the same year, he appeared in the show A Fina Flor do Samba, at the Teatro Opinião (Rio), singing his songs. The samba school Unidos de Vila Isabel paraded in the same year with his “Carnaval de ilusões” (with Gemeu). In 1968 and 1969, he continued to have his sambas-enredo sung by escolas de samba, having Eliana Pittman sing (with Rodolfo de Souza) his “Laiá do cais dourado” in the latter year. In 1968, he appeared in the show Samba Autêntico, No. 1 and in the IV FMPB, with “Casa de bamba.” The samba was included on his first LP, released in the same year through RCA Victor. The group A Voz do Samba (of whom he was a member) recorded an LP with his songs in 1970. “Segure tudo” reached the hit parade in 1972, and with “Canta, canta, minha gente” and “Disritmia,” he broke sales records in 1974. He continued composing the annual samba-enredo for the Unidos da Vila Isabel throughout the following years. His Tá delícia, tá gostoso (Sony, 1995) album sold 1.5 million copies. He had an entire album dedicated to his compositions by singer Simone in 1996 (Café com leite). He launched new talents of the samba community, like the groups Compassos da Vila and Roda de Saia, and the sambistas Agrião and Tiago Mocotó. Active as a black awareness proponent, he promoted interchanges with Africa in shows, lectures, and albums.